The French region of Occitanie / Pyrénées Méditerranée will get an additional 13 Alstom Coradia Polyvalent trains. This order is worth around 80 million euros (90 million USD). The region has already ordered 33 Coradia Polyvalent trains, type ‘Régiolis’, since 2014. The first one entered service in the region in May 2014. The addition of this current order will then bring the total up to 46 trains. This marks an investment of more than 330 million euros (370 million USD). Of the 13 units the region has ordered, 5 will be dual mode and 8 will be electric Régiolis trains. Alstom will supply them in their suburban permutation. These new trains will supplement Occitanie’s entire regional fleet. All 13 trains will be made up of four cars. Compared to the regional and intercity versions of these trains, these Régiolis trains will come with 50 percent more access doors. This will make passenger flow much easier. The Occitanie region also stipulated in the contract that the trains be equipped with automatic passenger counting systems, bicycle spaces and frontal destination displays. The Polyvalent is part of Alstom’s Coradia family. It is modular in nature, making it adaptable. Specifically, it is available in three lengths: 56m, 72m and 110m. Of course these trains comply with all the latest emission standards. In addition, they benefit from low maintenance costs. Furthermore, they are ERTMS-ready and they are the first French regional trains to meet all European standards, especially regarding access for passengers with reduced mobility. 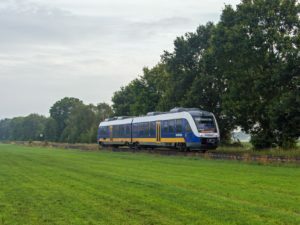 The Alstom Coradia Polyvalent is not just for the French market, however. For example, Alstom has sold units to Algeria and Senegal. Alstom designs and manufactures these trains in France. In fact, six of its twelve sites in France are involved in the project.